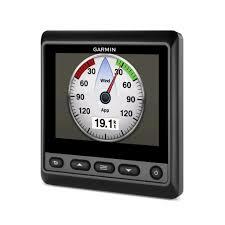 Marine instrument display clearly shows depth, speed, wind and 100+ marine and vessel parameters. Large, bright 4” color glass-bonded lens display with anti-glare finish. Enhanced daylight readability with new high contrast color option.The GMI 20 digital marine instrument display is perfectly designed for both power and sail vessels. Designed to clearly show depth, speed, wind and 100+ marine and vessel parameters, its large, bright 4” color display with extra large digits is easy to read at a distance and 170 degree viewing angle. Set Sail with EaseA glass-bonded finish lens on the GMI 20 prevents fogging and increases contrast. Daylight readability is enhanced with a high contrast color scheme. For enhanced night visibility, you have a choice of red/black, green/black or the normal night mode color scheme along with a dimmer control. Screens can be set to auto-scroll, cycling between pages automatically without your having to do a thing. This is especially advantageous to sailors as it allows you to install the unit(s) in a greater variety of locations on the vessel. Default profiles can be customized for powerboat, sailboat, fishing, engine/fuel, plus several other user-specified profiles. Power is supplied by the NMEA 2000® network. Two OptionsWhen selecting your GMI, there are 2 bundled versions to pick from: one includes a GWS™ 10 wind transducer and the other, a DST800 thru-hull smart transducer and GWS 10 transducer. The wind transducer records speed and direction, air temperature and barometric pressure. The thru-hull records water depth, water temperature and boat speed.